Toyota will have enough U.S. factory muscle to sell 215,000 Highlanders and Sequoia SUVs annually. 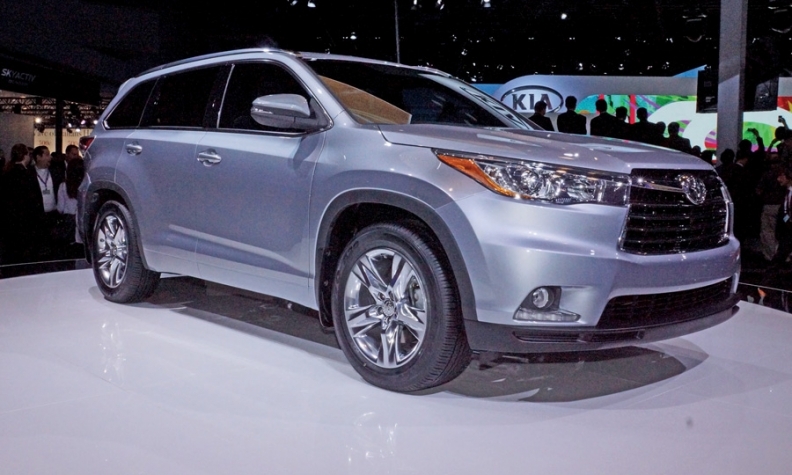 Pictured is the 2014 Highlander. Just months before increasing its production of Highlander large crossovers, Toyota says it will add still more Highlander capacity next year. The announcement today, representing a $30 million investment, will put another 15,000 units of capacity for gas-powered Highlanders in the automaker's plant in Princeton, Ind., in 2014. That is on top of an increase that will kick in later this year at Princeton to add 50,000 units of capacity for hybrid Highlanders, a plan unveiled last year. The two moves will give Toyota enough factory muscle to sell 215,000 Highlanders and Sequoia SUVs annually -- with Sequoia sales likely to be only a small portion of that total. Through the end of June, Toyota Motor Sales U.S.A. sold 61,771 Highlanders, up from 57,444 in the first six months of last year. Part of the Highlander volume will be exported to Russia and Australia starting late this year. In a statement released this afternoon by Toyota Motor Manufacturing Indiana Inc. in Princeton, the company said the newest expansion plan will result in a factory capable of producing 365,000 crossovers and SUVs a year. Princeton also produces the Sienna minivan. "This capacity increase is to meet growing demand for the Highlander and is a part of our strategy to build vehicles where we sell them," said Norm Bafunno, president of the Princeton operation.